Automotive household chemicals are some of the most toxic products found in or near the average home. Your garage, car port, workshop, and cabinets are often the best places to look for ways to create a more healthy home. If you live above or adjacent to an attached garage where vehicles, equipment, and chemical products are often stored, consider the below advice to reduce the health effects and other drawbacks associated with these most poisonous and environmentally damaging products. I get contacted quite frequently by over-garage apartment dwellers who are being poisoned by gases diffusing into their apartments from below. Deadly Carbon Monoxide gas, Benzene laden Gasoline vapors, and toxic fumes from paints and other solvent-based products stored below or beside garages will often pass through floors and walls into living spaces. Do not under-estimate the hazards found in storage areas anywhere under your home's roof. 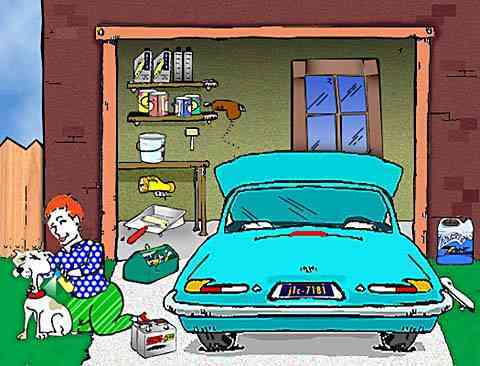 Automotive Household Chemicals Make Your Garage Hazardous to Your Health - Pollution Does Not Come Only From Tail Pipes! Have you ever walked into your garage on a hot summer day and noticed that strong chemical odor? Not exactly alpine fresh air is it? If you took that new car smell, added in some latex paint fumes, deck stain, car exhaust, varnish, buy spray, gasoline, oil, and oh yes a slight ting of air-freshener from that car deoderizer hanging on your rear view mirror, you'd probably have a good likeness of your garage's peculiar chemical smell on a typical afternoon. Unfortunately this pungent perfume is a gaseous cocktail of toxic airborne chemicals and it as as offensive to your body as it is your nose. In fact, that unique garage fragrance might as well be the Olfactory incarnation of hormone disruption, cancer, neuron damage, birth defects, impaired learning, liver toxicity, premature births, early puberty, and many other serious health problems because that's what it has been shown to cause in many cases. On a daily basis, many homeowners are exposed to hundreds or thousands of compounds exuded by the automotive chemicals stored in their garages. Below is a list of over 1,000 Automotive Household Chemicals and Specific Automotive Household Products which can contribute to poor indoor air quality in the garage. Automotive Products are amoung the most toxic household products in your home and they are commonly stockpiled in the garage. Most of the below listed products contain multiple toxic chemicals that can contribute to serious indoor air pollution and environmental damage. Many of these products contain volatile solvents and volatile organic chemical compounds (VOCs) that are released into the air when the container is opened. Their residues once applied also off-gas for some time after use. VOCs are some of the main causes of Sick Building Syndrome and indoor air pollution. If you have any of the below automotive products in your house (which is very likely) I strongly recommend you read the label closely for proper storage, disposal, and usage instructions. Then err on the side of caution and remove all household chemicals and products from any indoor living areas and adjacent areas such as the garage. Then safely store them in properly ventilated exterior storage areas where they can off-gas to the outside air rather than your inside air. But if you must have them, at least isolate them! Storing automotive household products and chemicals in exterior storage sheds is much safer than keeping them indoors or even in an attached garage. Despite the fact that every time you enter your garage you inhale any off-gased toxic chemicals, you should also be aware that chemical vapors have been shown to diffuse through cracks around doors and windows as well as pass into the attic space and then into the living area from attached garages. Worse yet, most garages even if insulated become very hot in summer months reaching temperatures over 110 degree Fahrenheit when the garage door is down. This is because cooling ducts aren't typically run to garages and windows and metal garage doors contribute significantly to interior heating. This added heat greatly accelerates off gasing of chemicals from automotive household products and other sources such as your automobile's interior. Just remember these toxins can enter your home as well if that automobile is in an attached garage! Such toxic chemicals as Polybrominated Diphenyl Ethers (PBDEs) and Phthalates have been shown to off-gas from most automobile interiors. PBDEs are flame-retardants used in your automobile's fabric backing, electronic enclosures, armrests, wire insulation, and many other plastic parts. PBDEs are also now found in most people's bloodstreams and has been shown to contribute significantly to our body burden of toxic chemicals. Phthalates are used as plasticizers to make plastics more flexible. It is commonly found in seat fabrics, sealers, exterior trims, instrument panels, and vinyl or polyvinyl chloride plastics (PVC). Both PBDEs and Phthalates are but two toxic chemical classes which are now proven to contribute to a host of serious health problems. Several studies have shown that drivers routinely inhale these toxic chemicals via dust and gases while driving in their vehicles. It is also proven that UV light and heat from the sun super heating the interior of automobiles makes PBDEs and Phthalates particularly concentrated in automobile interiors. No wonder automobile air purifiers are becoming ever more popular. An effective car air purifier requires special chemical vapor filters such as those containing Activated Carbon, which has a very high pore volume into which chemical fumes get adsorbed and held. Just be aware that most car air cleaners are not very effective because they do not move enough air through, or they contain too little chemical filtration media, or lack the proper filters for cleaning the air of chemical fumes. The best solution is source control. Try to eliminate as many store-bought household chemicals and products as is possible. You can easily and cheaply make your own non-toxic alternatives. Many of these home-made household products are much safer, are much cheaper, are fun to make, are eco-friendly, and in some cases are even more effective than many of the below expensive store-bought household products. For the below list of over 1,000 specific automotive household chemicals and products we will be adding specific chemical component information, manufacturer contact information, and MSDS information in the near future. Much more specific information about the above automotive household chemicals is coming soon. We will be providing chemical component breakdown by percentage content, MSDS information about components, manufacturer's contact information, and alternative recipes and tips to help elliminate these automotive household chemical products from your home. SOURCE CONTROL IS OUR GOAL!